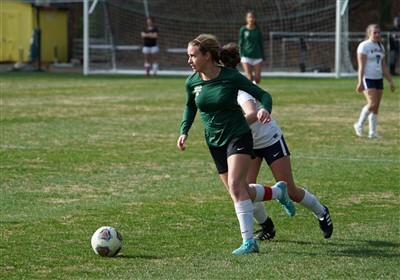 Over the past few weekends, our varsity soccer teams have been competing in tournaments. Varsity boys traveled to John Milledge Academy where they came back champions. Both boys and girls played in the Under the Cross tournament at Sherwood Christian Academy where they both finished as runner-up. The boys team played some tough games at the John Milledge Academy tournament against the host school, Deerfield Windsor Academy, and Lake Oconee Academy who they defeated in the championship game with a final score of 2-0. At the Under the Cross tournament, both boys and girls each played four games. The boys team handled their first opponents: Coastal Georgia, 4-0, and Westover, 8-1. On Saturday, the boys raced passed their third opponent Calvary, 5-1, and onto the championship game. At the end of regulation against Halo Wolfpack, the game was tied and the boys were unsuccessful in penalty kicks. The girls have a similar story from the Under the Cross tournament. They also handled their first three opponents: First Presbyterian, 6-3, Halo Wolfpack, 6-2, and Sherwood Christian, 2-0. Their winning streak was ended in the final game against Coastal Georgia, 0-3.